The best flea treatment for dogs should be effective, convenient, and safe enough to use around kids and other pets. To find our top picks, we consulted three vets and an entomologist, researched active ingredients, then examined the top spot-on and oral meds ourselves. In the end, the right choice for you is a matter of your dog’s needs and personal convenience. We considered two types of flea treatments for dogs: Spot-ons and oral medications. Of all the ways to treat your pet’s fleas, these are the most effective and convenient to use. Spot-ons are concentrated liquid formulas that you apply to the back of a dog’s neck. Within 24 hours, the medication dissipates into the dog’s natural skin oils, killing fleas and preventing new generations from developing for up to a month. Oral medications use insecticides that transfer into a dog’s blood stream in less than an hour. When fleas bite, they’re exposed to the insecticide and die. Oral products are faster-acting than spot-ons (wiping out the bugs in as little as one hour), but only last a day. They won’t protect your dog from future infestations. We held both types to the same standards: They had to use safe, effective ingredients and be convenient to buy and apply. The best one for you will depend on your dog’s needs and pricing. See our flea treatment buying guide for help choosing the right treatment for your pup. Effective flea treatments must use some form of pesticide; that’s how they’re able to wipe out the bugs. While all pesticides used in flea treatment are approved by the EPA, some can still cause serious side effects in humans and animals if they’re handled incorrectly. When it comes to the health and safety of our pets, we prefer to err on the side of caution. We turned to places like the National Pesticide Information Center (NPIC) and the National Center for Biotechnology Information (NCBI) to determine which pesticides to avoid. Our top picks use the safest, most pet- and people-friendly ingredients to treat your dog’s flea problem. But keep in mind: They’re still chemical products intended to kill insects. They can be harmful if they’re ingested or rubbed into an eye. That’s why it’s so important to avoid touching any topical medication directly and always wash your hands after applying it. Tetrachlorvinphos: According to the EPA and Humane Society, overexposure to this insecticide may cause nausea, dizziness, and confusion. In rare instances, it can even be fatal. Pyrethroids: The Agency for Toxic Substances & Disease Registration, a branch of the CDC, says that humans exposed to pyrethroids can experience numbness, itching, burning, stinging, or tingling. Check labels for any ingredient that ends in “-thin” (permethrin, deltamethrin, flumethrin, etc,) and etofenprox. Pyrethrin: Cat owners should avoid anything with pyrethrin, a natural insecticide that’s safe for dogs and humans but can trigger seizures in cats. All of our top picks are pyrethrin-free, just to be safe. All of our top picks work to kill existing fleas, eradicating your dog’s itchy discomfort in the moment. But if you keep a multi-pet household that may be prone to repeat infestations, or if your dog is often exposed to fleas and ticks, you’ll want a medication that prevents the problem from happening again. That means spot-on treatment. We only considered spot-ons that use a combination of insecticides and insect-growth regulators (IGRs). Insecticides take care of the current infestation, while IGRs protect against future ones. In fact, the addition of IGR is where the “plus” comes from in Frontline Plus, PetArmor Plus, and Sentry Fiproguard Plus (they’re not just trying to impress you). Why not kill two bugs with one stone? Ticks are found in most areas of the United States, and can transmit Lyme disease, Rocky Mountain spotted fever, and other bug-borne diseases to your pet — which are much easier to prevent than to treat. With that in mind, we only considered spot-on flea treatments that also kill ticks. Our first three picks use a one-two punch to kill existing fleas and prevent future infestations. These are spot-on treatments: small packets of liquid medication that you dab on the back of your dog’s neck (where they can’t lick it off). All three use active ingredients fipronil to eradicate current fleas, and (s)-methoprene to prevent future generations. This combination has been proven to kill 100 percent of fleas within seven days. These medications are recommended for dogs that have frequent exposure to either fleas or ticks, and need proactive protection in addition to relief from a current infestation. Although Frontline Plus uses the same active ingredients as PetArmor and Sentry, it should get to work a little faster. 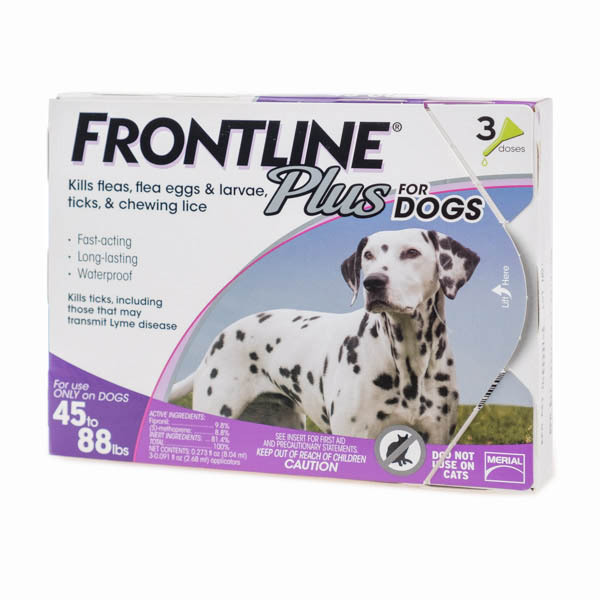 Frontline Plus states that it starts killing fleas within four hours and wipes out 100 percent of the pests within 12. The other two take 12 hours to even begin killing fleas. If you need a monthly treatment and want to give your pet rapid relief from a current infestation, Frontline is your best bet. Hands-on testing secured Frontline’s place as our favorite monthly flea treatment. Specifically, we learned that Frontline uses a superior applicator compared to PetArmor and Sentry. To open, you peel off the protective seal then snap off the long, narrow tip. The other two had to be cut open, leaking medication onto the scissors every time. This may sound like a minor detail, but it’s always best to err on the side of less spillage when handling chemical products. The biggest downside to Frontline is that it’s generally more expensive that our other two picks. For large dogs (more than 44 pounds) in particular, Frontline is nearly twice the price of PetArmor. It’s a little pricer for dogs under 44 pounds, too, ringing in a few dollars above our other picks. The price bump may be worth it for fast-acting flea relief and better application — but if you’re on a budget, you may prefer PetArmor Plus or Sentry Fiproguard Plus for a monthly treatment. Although most spot-ons have a chemical odor (they are chemicals, after all) Frontline was a worse culprit than some. It has a distinctly harsh scent compared to PetArmor and Sentry’s spot-on treatments. We recommend avoiding this one if you (or your dog) have a super sensitive nose. Like Frontline, PetArmor Plus uses fipronil to kill existing fleas and (s)-methoprene to prevent them from coming back. The two treatments even look almost identical, delivered in packs of three applications, for three different dog sizes. However, PetArmor tends to be cheaper than the competition — almost half the cost of Frontline for dogs over 44 pounds. The tradeoff: It’s a bit slower acting and not as easy to apply. But if you’re mainly looking for preventative benefits (not an on-the-spot flea killer), then it’s probably worth it to save a few bucks with PetArmor. PetArmor Plus also has a gentler scent than Frontline. It’s almost citrus-y, rather than the sharp chemical odor we noticed with other spot-on treatments. It’s a minor detail, but will make treating your pup a little more pleasant for both parties. The main difference between PetArmor and Frontline Plus is reaction time: PetArmor takes up to 12 hours just to start killing fleas, while Frontline should have the problem eradicated in the same time frame. That said, both medications are equally effective at protecting your dog from fleas and ticks throughout the month. If your dog doesn’t need immediate itch relief, then the longer set-in time shouldn’t be a problem. We didn’t love the PetArmor Plus applicator. It has to be cut open and tends to leak medicine out when you do so. You’ll have to be extra careful about rinsing off the scissors and washing your hands when using this treatment to make sure chemicals don’t end up where they shouldn’t. 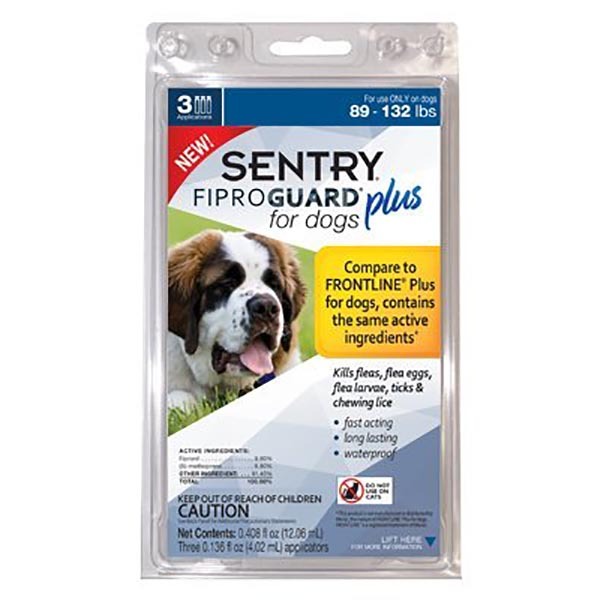 Sentry’s Fiproguard Plus treatment is cheaper than Frontline Plus for dogs under 44 pounds, and the same price for dogs over 44 pounds. It’s generally not as affordable as PetArmor Plus. That said, it has the same active ingredients and is equally as effective — so if you see it on sale or for a lower price than PetArmor, you should feel good about making the leap. We found Sentry Fiproguard to have a mild, inoffensive scent. It’s less overtly chemical than Frontline and some of the other spot-ons we tested. This is another good choice (along with PetArmor) for pet owners with sensitive noses. Sentry’s spot-on medication takes 12 hours to start knocking out fleas, just like PetArmor Plus. This won’t be an issue if you’re purely looking for monthly, preventative treatment, and not immediate relief from a current flea infestation. If your pup does need rapid action along with monthly protection, try Frontline Plus — which gets to work in just four hours. Sentry Fiproguard also has the same leak-prone applicator as PetArmor Plus. That means you’ll need to use special caution when handling it, to make sure none of the medication ends up in a potentially harmful place (like your mouth or eyes). Our next three picks are for dogs that need fast-acting relief from a nasty flea infestation. These oral medications get to work immediately — using active ingredients imidacloprid or nitenpyram to kill up to 96 percent of fleas within the hour. Keep in mind: effects only last up to 24 hours. If your pup needs preventative treatment as well, follow up with one of our top spot-on treatments after a few days. Never combine flea medicines at the same time without talking to your vet first. 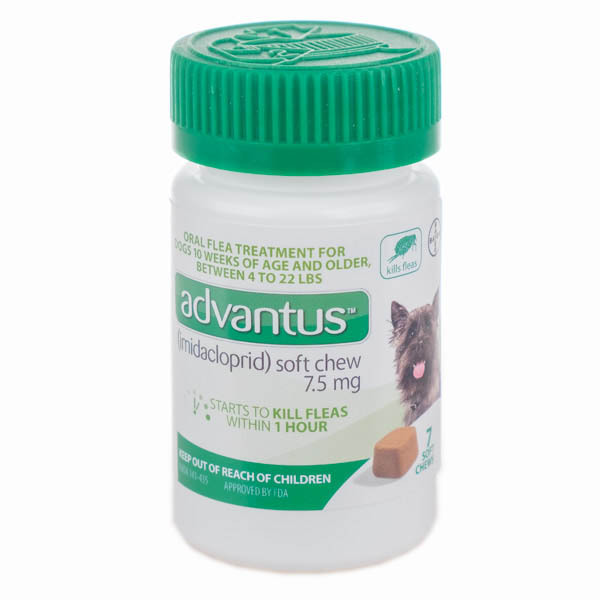 Bayer Advantus Soft Chews use imidacloprid to eradicate your dog’s flea problem. This insecticide acts quickly — dispersing through the dog’s blood stream and killing up to 96 percent of fleas within the hour. The best part about Bayer’s soft chews: They look, smell, (and presumably taste) like regular dog treats. It’s the only flea medication on our list that your pup will actually enjoy taking. This bumped Bayer’s treatment above PetArmor FastCaps and Sentry Capguard in our rankings; both of which come in a traditional pill form that you’ll have to trick your dog into swallowing. The soft chew regimen tends to be more expensive than other fast-acting flea meds. This is true for large dogs in particular: Bayer chews ($26) cost twice as much as PetArmor Fast Caps ($13) for dogs over 25 pounds. If your dog is under 25 pounds, Bayer soft chews will cost you $25 — the same price as Sentry Capguard, although PetArmor is still cheapest at $20. 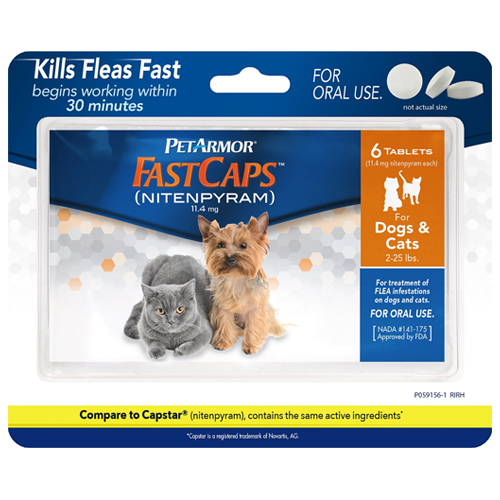 PetArmor Fast Caps use nitenpyram to treat flea infestations. This is one of the fastest-acting insecticides on the market, and should start killing fleas in just 30 minutes. The only other treatment on our list with the same active ingredient is Sentry Capguard — either one is a great choice for giving your pet near-instant relief from itchy pests. 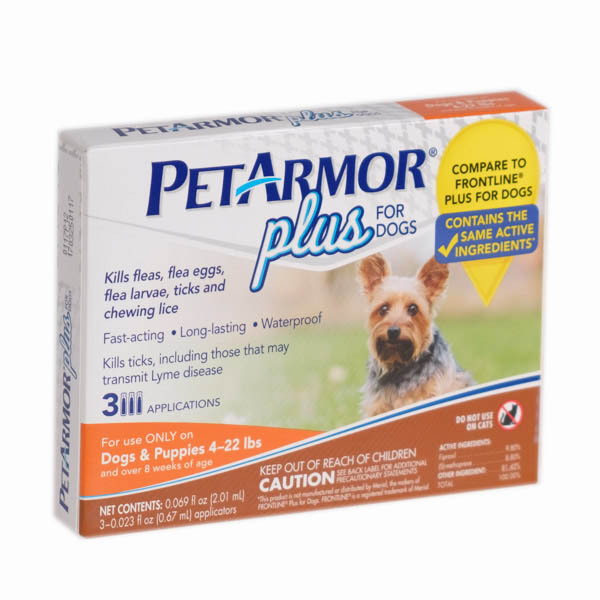 If you have a large dog (think 25 pounds and up), PetArmor FastCaps are probably the cheapest way to treat it for fleas. You can get six FastCaps about half the price of other rapid-relief medications. PetArmor tends to be cheaper for small dogs, too, but the difference isn’t as drastic — about $5 less than the next cheapest option. The downside to PetArmor’s FastCaps is that they come in swallow-whole pill form — and anyone who’s had to treat their dog before knows how reluctant they are to taking meds. You’ll have to go the extra length of hiding the FastCaps in your pup’s food. If you’ve got a cunning canine who knows how to work around the old tricks, you may be better off with Bayer Soft Chews, which mimic a dog treat and are a lot easier to administer. 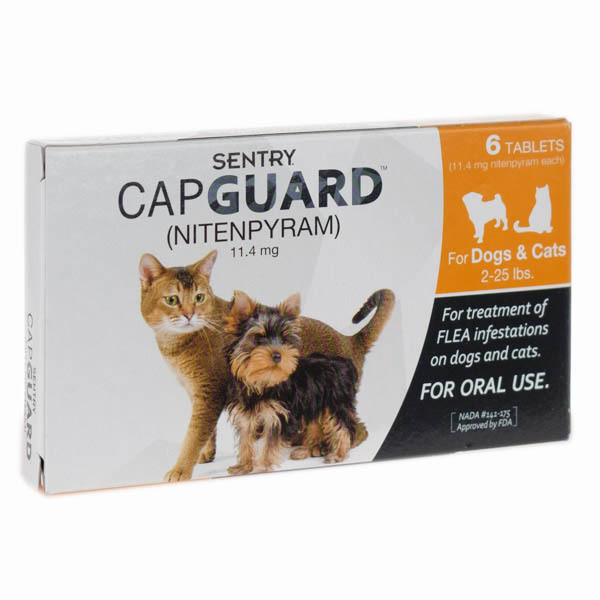 Sentry Capguard uses nitenpyram to fight fleas — a powerful insecticide that you can expect to take effect in as little as 30 minutes. That’s a quicker response time than any of our other top picks (except PetArmor FastCaps, which use the same active ingredient). These tablets are a guaranteed way to get your dog feeling better, faster. Sentry Capguards aren’t quite as affordable as PetArmor FastCaps, with prices starting at $22 for 6 treatments while PetArmor starts at just $13. Still, Sentry’s treatment packages for both large and small dogs are a few bucks cheaper than the soft chews from Bayer. They contain the same active ingredients as PetArmor tablets, too — so if you happen across Sentry Capguards on sale, you should definitely snag them. Like the PetArmor FastCaps, Sentry Capguards come in a small, hard pill, about the size of an aspirin. They’re ultra-fast acting — but the catch is that you have to get an unwilling dog to swallow them. We recommend hiding the tablets in their food or a spoonful of peanut butter. If it’s still a no-go, try Bayer Soft Chews instead for a treatment your dog will willingly take. The two types of flea treatment we reviewed have distinctly different benefits. Liquid spot-on treatments (like our first three picks) have flea- and tick-inhibiting chemicals that will protect your dog from pests for up to a month. They’re a great choice for households that have had repeat fleas, or dogs that spend a lot of time in the woods being exposed to ticks. That said, spot-on treatments may take up to 12 hours to begin killing fleas off — so if your pup is suffering an acute infestation and needs immediate relief, they aren’t the best choice. For fast-acting extermination, try an oral flea medication instead (like our last three picks); these can kill up to 96 percent of fleas within the hour. Just keep in mind that these effects only last for a day. If your dog still needs ongoing protection from fleas, ticks, and lice, you’ll have to follow up after a few days with a preventative medication. Never use two different types of medication at the same time without consulting your veterinarian first. Different size dogs require different doses of medication. Most oral flea treatments come in two varieties: for dogs 4-22 pounds, and 23+ pounds. Spot-on treatments generally offer three different doses: for dogs 5-22 pounds, 23-44 pounds, and 44+ pounds. Be sure to check the box before you buy and make sure you’re getting the right dose for your pup’s weight. All of our top picks use active ingredients that are safe for people and other pets; we made sure of it. If you’re considering other flea medications, though, you’ll want to be sure that they don’t present any dangers for your household. In particular, we recommend looking out for the ingredient pyrethrin — a naturally-derived insecticide that is safe for dogs and humans but may cause seizures in cats. For other recommendations and safety warnings, you can turn to these resources from the Humane Society, the Environmental Protection Agency, and the Agency for Toxic Substances and Disease Registry. What are the different types of flea treatments for dogs? There are a few types of flea treatment for dogs. We stuck with spot-on treatments and oral medications, because they’re convenient to buy and easy to administer. Wondering what else is available? Flea collars contain insecticides that either repel fleas or absorb into dogs’ fat layer to kill fleas. The ones we found last anywhere from six to 12 weeks. We didn’t end up reviewing any flea collars, as all of them contained at least one of the potentially harmful insecticides we avoided. Flea shampoos kill adult fleas quickly, and typically only last 24 hours, like oral medications. These use potent insecticides and are generally only necessary for a severe infestation. (They’re also a lot messier to use than a spot-on or oral treatment). Flea sprays linger in the oils on a dog’s skin. They work a lot like spot-ons, but are more diluted and have to be applied all over the dog’s body as often as once per week. This is a lot less convenient than spot-on treatment, which usually only has to be applied once per month for the same benefits. How does flea treatment work? Flea treatments use insecticides (a.k.a. pesticides) to kill the fleas that have made a home on your pet. This may sound scary, but all insecticides used in flea medication must be approved by the Environmental Protection Agency before making it onto shelves. That means they’re safe for use on pets and around people. In addition to insecticides that kill off adult fleas, spot-on treatments like Frontline Plus, PetArmor Plus, and Sentry Fiproguard Plus use something called insect-growth regulators (IGRs). Ralph Williams, PhD, a veterinarian and public health entomologist, explains: “IGRs are chemicals that mimic natural insect hormones to prevent them from laying eggs.” They prevent fleas from reproducing so that your pup won’t get a repeat infestation. Do natural flea treatments work? There are a handful of “natural,” essential oil-based flea treatments on the market that claim to combat fleas without using insecticides. They’re made with ingredients like clove oil, cedarwood oil, and lemongrass oil. None of the veterinarians we spoke with could verify that these products actually kill fleas, so we didn’t include them in this review. All of our top picks are guaranteed to have your pet’s flea infestation under control in under a week (but usually in as little as one day). Owning a dog isn’t all about fleas, ticks, and hiding pills in hunks of cheese. But it helps to get that stuff out of the way so you can enjoy the fun parts. We’ve reviewed some of the most important topics — from dog food to pet insurance — so that you can keep you best friend happy and healthy.